Honest people and Great service! Gavin and Jimmy are so helpful! We had a wonderful experience at Beach Cities RV, they are small but way better in service than anywhere else we've been! Trust these guys! Fantastic service. I would drive miles to use these guys. They fixed one issue and told me what part I needed for the fridge so I can get it ordered when I'm back home. My wife and I just had the most wonderful rv buying experience. I cannot recommend these guys enough such a pleasant experience , thanks for all your help Jim! We took our Pleasure Way Sprinter Van to Beach Cities RV specially because they could install screens for the back and sliding doors. While we were at it also decided to have them service a few items in the coach. All the items were taken care of and even with a glitch that came up they worked through it in a professional and fair way. In fact, I would say that how possible conflict is handled really shows whether the customer service is a nicety or a reality. I can say their handling of it made them shine!! Our contact was with more than one person in the front office as well as a service person and all of them were straightforward, friendly and honest. Even though we live quite a distance away & in another county, there's no question in my mind that if we were in the market for a new RV this would be the place we would go! Friendly, competent, fair & honest. What else could you ask for. Responsive people here. I will check the inventory here when I am ready to purchase my Class B. This is a big deal for me. I don't usually post reviews, especially positive ones, but this place deserves it. I've been on a tiny home kick for a few years now, but my wife just isn't having it. We both love to travel and see new things, but she hates to fly, so I started considering an RV as a way to combine our gypsy wanderlust with my tiny home/minimalistic living fixation. Our first hurdle is that we knew nothing about RV's. I had originally thought about going by one of the Giant RV Superstores to have more layouts to look at, but the reviews were so consistently negative that I chose to keep looking. As with anything new, a negative experience the first time out is usually a recipe for apathy (at the best) later. At the time, Beach Cities RV had no reviews so I was taking a bit of a chance...hopefully now, others will feel good about coming here. The owner came out to meet us, I explained our situation...made it very clear that this was more window shopping for the RV lifestyle rather than an actual motorhome, and that our purchase timeframe was likely years from now. He spent almost an hour with us, being very candid about the pros and cons of each layout, why one chassis/engine is better than the others, and the realities of owning a coach. In the end, the experience was very positive and we both left feeling encouraged about our plans, and perhaps a bit more eager. It's easy to provide good service when there is money on the line. They knew we weren't going to buy anytime soon and still took the time to walk us through our many questions. When we are ready to purchase, I will definitely remember the level of service we received and will make Beach Cities RV our first (and hopefully only) stop. I recently bought a used RV from Beach Cities RV, and it was the best used vehicle buying experience I’ve ever had. I got what I feel was a good deal, and they made sure everything was right. Before letting me take possession, they corrected an electrical issue that I didn’t even know existed. There was a mechanical problem shortly after I started driving my new purchase, and I went back looking for advice/recommendation on where/how to fix it, and they took care of the problem within a day without any charge! I’m a happy camper and would recommend these guys to anyone. We took our Pleasure Way Sprinter Van to Beach Cities RV specially because they could install screens for the back and sliding doors. While we were at it also decided to have them service a few items in the coach. All the items were taken care of and even with a glitch that came up they worked through it in a professional and fair way. In fact, I would say that how possible conflict is handled really shows whether the customer service is a nicety or a reality. I can say their handling of it made them shine!! Our contact was with more than one person in the front office as well as a service person and all of them were straightforward, friendly and honest. Even though we live quite a distance away & in another county, there’s no question in my mind that if we were in the market for a new RV this would be the place we would go! Friendly, competent, fair & honest. What else could you ask for. We were so impressed with Beach Cities RV, and especially Jim, who was very accommodating to our needs. We live in upstate NY, and in searching the internet found just the perfect conversion van for us. We put a deposit down over the phone and a month later flew out and bought it during a week that we had scheduled for a vacation. Beach cities had our van all ready, picked us up at the airport, helped us through the purchase process and orientation, and helped us get underway. They were then kind enough to store our rig for an upcoming trip three months from our original deposit. Jim couldn’t have been more helpful. The whole crew there, Gavin, Brian, and Phillip , were friendly and helpful and knowledgeable and committed to their stated mission of making the purchase of an RV a positive experience. We felt the price was fair. Hats off to these folks! We would certainly hope to deal with them for any future RV upgrade or purchase. WOW!!! Beach Cities RV made my dream come true!!! Awesome service from the guys, Brian, Jim, Gavin and Phil and the rest of the crew. What a great group of guys!!! I am having so much fun in my “full time” home on the road. Oh the places I will see!!! These guys exceeded my expectations on delivery. This is not your usual experience when purchasing a used vehicle it was comfortable and hassle free. As a single lady I was treated with the utmost care and respect. I felt more like a family member than a customer. Please take my advice and let them help you find the motor home of your dreams and get on the road and see what you have been missing. Happy Traveling!!! what can I say. Everything that someone thinks of when buying an rv - cheesy and shady salesman, shifty deals, and overpriced opportunities. None of which I experienced at beach cities rv. Jim, Gavin and the entire crew were straight forward and easy to communicate with and not only did they want to make a deal, they wanted the deal to be fair for both parties. The day of delivery, their team went above and beyond to make sure that my rv was in exemplary condition. Can’t say enough good things about the people and experience at this dealer. It makes me feel like I won’t be afraid to do it again someday. Thanks guys! These guys are the best! 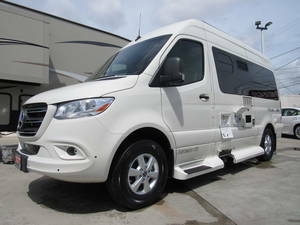 My wife and I started looking for an RV on the Internet when we came across the pleasure way sprinter conversions. We live in Alaska and there are no pleasure way dealers here. We found a listing for what we were looking for at Beach City RV. I made a call and was told about the unit we were interested in, their ad was very well done,lots of good pics, it was a used unit and was told it was pretty much like brand new, we decided to put a deposit on it sight unseen, besides the pics. We sent them our itinerary and we were picked up at the airport and taken to their lot(by one of the owners) the coach was exactly as we were told, like brand new! They had it completely detailed and all set up for a thorough walk through. They whent through every system thoroughly and answered all our questions. We bought the unit and are on our way back to Alaska! It was a very pleasant experience and we would highly recommend using Beach City RV. Thanks guys! We recently sold our RV to Brian Cerwin at Beach Cities RV. We found Brian to be most professional and honest and put our minds at ease that we were getting a good price and that we could trust him. The sale went without a hitch and we were most pleased. You can trust Beach Cities RV whether you are purchasing or selling. This is absolutely the best place to purchase a used RV. Everyone there goes out of their way to make sure you are happy and have a great experience. They go through all their RVs on the lot making sure they are in pristine shape and working order. We bought our RV last Wednesday and hung out in the area before returning to Nevada. Camped down in Huntington Beach for a couple of nights. We couldn’t get the DVD to display on the TV. I had recorded most instructions, but not these. They sent Phillip down to our campground to help us!!! It was a simple fix and we got to enjoy a movie later that night. Great great group of people and am SO happy we bought our wonderful RV from Beach Cities RV! Thank you Gavin, Phillip, and everyone there!! Brian, Jim and Gavin, owners of Beach Cities RV, provided me with the best overall service and accommodations of all the RV businesses that I contacted. Although I had decided on a specific model when I first contacted Beach Cities RV, they validated my decision with their vast knowledge based on cumulative years of experience and ongoing relationships with the manufacturers. Their communication was timely and effective. Negotiations proceeded smoothly with fairness and integrity. Every person that I encountered at Beach Cities RV was friendly and hospitable. This is my first RV and I know I may call on Beach Cities RV with any questions or concerns, now and in the future. Great people great experience. Highly recommend. The most honest folks in town it’s not like wasting your time at the Mega stores were they only try to empress you with lies. My wife and I researched Rv’s and decided on our vehicle of choice. Lo to behold the model we wanted was hard to find but we did locate one at Beach Cities in California. As we live in New Mexico we weren’t sure how we could buy the RV out of state. So, we called Beach Cities RV and were fully informed of the process for buying and taking delivery of the RV. The owners, Jim, Brian and Gavin flew us out to California to look at the vehicle before purchasing it. We were picked up at the airport by Jim and then spent the rest of the morning on the Beach Cities lot. Gavin gave us a thorough demonstration of how everything worked and was very patient with our many questions. By this time we knew we wanted to purchase the vehicle. Jim again walked us through the paperwork process and by early afternoon Brian had rented us a car, he got in the RV, and we followed him across the state line to take position of the RV. Brian made sure we were totally happy with the purchase and we were ready to drive our new RV home. We couldn’t have asked for a better experience, Jim, Gavin and Brian are all very professional and their integrity came though clearly. It was a big purchase for us but their non-pressure approach and thoroughness made us feel very comfortable with buying the RV. On the way back to New Mexico, we camped a night in Arizona and found there was a problem with the coach battery. We called Gavin who helped us diagnose the issue and how to double check it when we arrived home. He told us that if the battery was bad, Beach Cities would reimburse us for a new one. Indeed it was bad and true to their promise they sent us a check for the new battery. We are enjoying our RV and are pleased with our great experience in buying the vehicle. We highly recommend Beach Cities RV to anyone interested in purchasing an RV. They’ll treat you right! 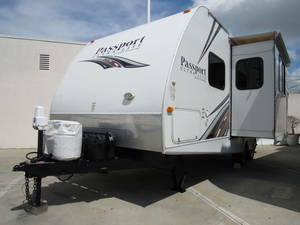 Description , pictures and discussion’s regarding the RV and buying process were spot on, no surprises. Pros and Cons of the RV, engine, chassis and etc. The inspection with Philip (RV tech) were detailed and anything we felt needed to be addressed were noted, completed and checked off with us before departing. The level of customer service (pick up at the airport, lunch, patience, research) which is still important, surpassed any that we have dealt with now and in the past. No hard sell, introduced us to Philip (rv tech) and allowed us to spend our time looking at the RV. Both Philips inspection and the Private RV inspection we had done prior to arrival was spot on the same. (The coach was as described "pristine" and issues found had been addressed. In closing, the level of professionalism made the entire purchasing process easy! We’ve owned 5 motorhomes over the last 40+ years, and learned to research high quality coaches and search thoroughly to get the best condition and price. For over two years we searched for a shorter Country Coach and found Beach Cities RV ad online and called them. As we are 500 miles away in Northern California we couldn’t just stop and look. I spoke several times with Brian who was thorough in answering my questions and emailing several requested photos and specs. I was pleased with the detailed information and we drove to Southern California and spent most of the next day going over the unit with Jim. Lots of detailed answers, including what he didn’t know and took the time to find out for us. There was absolutely no pressure, we had the time we wanted to come to our decision to buy the Country Coach, and the price was very fair. The coach was in excellent shape, but we did have a list of several small things we wanted done. They took care of every single item. Gavin delivered the coach to us in Northern California, and made sure everything was to our satisfaction. These men pick really good units to sell, treated us with respect, and kept every commitment they made. In our experience these guys are first class and trustworthy. Michael J. This is a follow up on our post. We are 2 months and 7000 miles into using our Country Coach (coast to coast 15 states) and, like every maiden voyage in a motorhome new to us, we encountered some things the first two weeks that were not working as we thought they should. We had no written guarantee from these folks, just their good word, and they kept that word entirely to our satisfaction in covering the problems. These guys have my trust and respect for their action to make sure the customer is satisfied. We are loving this motorhome and grateful we bought it from Jim, Gavin, and Brian. This was our first big RV purchase. The process couldnt have gone any smoother. Brian, Jim and Gavin have the paperwork process streamlined which had us driving away in no time at all. Also the no pressure and hassle free process had us feeling at ease. Beach Cities only carry hand selected and high end coaches which gives you a few options to chose from. We drove off in a 2008 Fleetwood Excursion 40X. This coach is about 41 feet long, but drives like a Lexus. We would definetely recommend Beach Cities RV to anyone that is considering to purchase an RV. I recently made a purchase from Beach Cities RV and was pleasantly surprised at how painless and straight-up the experience was. When I arrived I was in full defense mode expecting a day of dog and pony shows so typical of your common dealership; a day of playing games with a salesman. What I got was a refreshing, low pressure, very comfortable transaction. I highly recommend Beach Cities RV to anyone interested in purchasing an RV and commend them for their integrity and laid back, no pressure approach to the buyer. They told me they are taking the RV buying experience to a new level and I believe that is what they have done. I had been looking for a specific RV coach and using the internet found exactly what I wanted at a dealership located in CA over 600 miles away from home, Beach Cities RV. Two red flags came to mind; vehicle unseen and salesmen/dealership unknown and I almost passed this over because even if I liked the vehicle, I would rather be at the dentist getting a root canal then meeting a car salesman. I prefer to buy direct from an owner but this vehicle appeared to be just what I wanted. My internet query was answered by Brian Cerwin and we began an exchange that eventually settled on a price agreeable to both of us. All that was left to do was to have a look for myself and so I made a road trip in to visit them on a Saturday. When I arrived a half hour early the coach fully prepped and ready to go; fresh engine and generator oil, propane filled, interior completely cleaned, the chassis lubed, fridge cold and the water tank filled, but more importantly its condition was exactly what I was told it would be. Our check-over completed it came down to the time I was dreading, sitting down with the salesman. I preemptively struck with, "try to sale me any extras and I’m outta here". Gavin coolly responded with a not a problem and if you liked what you saw let’s sign the papers. Everything was ready to go and for precisely the amounts that I was promised. No funny business, no add-ons or questionable charges. When all was done, Brian then drove the vehicle across the border into Nevada for delivery to save me the exorbitant 8% California sales tax. He later called me on Monday to see if I had arrived home safe and without incident. Thanks to Brian, Gavin and the rest at Beach Cities RV. We recently sold an RV to Beach Cities RV in Midway City, CA. They contacted us as a result of an ad I had placed on line. I found them to be very easy to work with! They met our requirements for a down payment and followed through quickly with picking up the RV where we live in Sonoma County, CA. A pleasure to work with. I would do it again if the need arises! As a seasoned RV’er, I would never even consider selling my RV to a dealer, but these guys were so easy to work with and gave me an agree-able and fair price up front. I was totally impressed by their "go for it" attitude and personalities. They are a jewel in the industry that still welcomes the customer and is out to prove that the customer is number one. I absolutely recommend them over ANY dealership, small or large. Beach Cities RV sold my R.V. From the get go they were very up front and courteous. After reviewing my RV with me over a phone conversation they were confident that they could find a seller. I discussed their backgrounds and their approach to selling the RV on my initial phone conversation and within a few minutes I was sure that they were the company that I would solicit to find a buyer. I live 50 miles from their location and they had no issues with driving to my house and picking up the RV. Note that I have since had them tell me that they have traveled to the east coast to pick up a motorhome as well. (If they didn’t know the business or lacked the confidence I am sure that they would not be traveling across the country to pick up a motorhome.) My motorhome was clean but their standards are such that they detailed the coach, took photos, and listed it on their website. If you are serious about selling your RV I would recommend calling Beach Cities RV and talking to them. If you are skeptical I would have you think about one item that I thought about and why I let them sell my coach. What is it worth not having to put an ad in RV online, answer the phone, wait for someone to show up to look at the RV and hope that they can get financing or have the cash. It was nice not having to worry about any of these!. Beach Cities did all of the work for me. Beach Cities RV went out their way to sell my mother-in-law’s 5th wheel. Brian Cerwin flew up to Priest River, Idaho with a copy of the Title in hand. My MIL was able to sell her RV with little problem. Beach Cities RV did a GREAT job of selling my RV -- even though I was not purchasing one from them. They handled every aspect of the sale, including the detailing & servicing of my RV for the new owner as well as all the DMV paperwork. Jim and Brian couldn’t have made it easier for me - and I received the full consignment price in less than one month from the date I signed the consignment agreement. I wouldn’t hesitate to refer them to friends and family. My wife and I purchased a 2002 Winnebago Journey from Beach Cities RV. We worked with Brian Cerwin and Jim Geraci and they were extremely knowlegeable. They knew the RV inside and out. There were a lot of choices out there for us but the coach was exactly what we were looking for and we liked the people. They kept us updated thruout the transaction and when we came in to pick it up, everything was completed and nicely detailed. They exceeded our expectations. We have owned 3 motorhomes and this was by far the best experience we have ever had. We would highly recommend Beach Cities RV to anyone looking for an RV. We just finish a transaction for a RV from Beach Cities RV and I have to tell you we are completely satisfied with the service and treatment we received. Both Jim and Gavin were professional and informative. We were able to finalize the deal over the phone as we were traveling. On our walk through today Gavin answered all our questions and we left confident that we would be able to operate all the functions on the RV. Both Marilyn and I would recommend Beach Cities RV to anyone looking for a recreation vehicle . This is a big deal for me. I don’t usually post reviews, especially positive ones, but this place deserves it. I’ve been on a tiny home kick for a few years now, but my wife just isn’t having it. We both love to travel and see new things, but she hates to fly, so I started considering an RV as a way to combine our gypsy wanderlust with my tiny home/minimalistic living fixation. Our first hurdle is that we knew nothing about RV’s. I had originally thought about going by one of the Giant RV Superstores to have more layouts to look at, but the reviews were so consistently negative that I chose to keep looking. As with anything new, a negative experience the first time out is usually a recipe for apathy (at the best) later. At the time, Beach Cities RV had no reviews so I was taking a bit of a chance… hopefully now, others will feel good about coming here. The owner came out to meet us, I explained our situation… made it very clear that this was more window shopping for the RV lifestyle rather than an actual motorhome, and that our purchase timeframe was likely years from now. He spent almost an hour with us, being very candid about the pros and cons of each layout, why one chassis/engine is better than the others, and the realities of owning a coach. In the end, the experience was very positive and we both left feeling encouraged about our plans, and perhaps a bit more eager. It’s easy to provide good service when there is money on the line. They knew we weren’t going to buy anytime soon and still took the time to walk us through our many questions. When we are ready to purchase, I will definitely remember the level of service we received and will make Beach Cities RV our first (and hopefully only) stop.